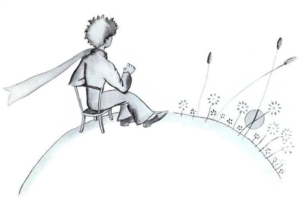 Gradually, I came to understand the secrets of the little prince’s life. For a long time his only entertainment was looking at beautiful sunsets. But on his little planet, you only needed to pull your chair a few steps. And you could watch the sun going down whenever you wished. “On the day of the forty-three sunsets, were you feeling very sad?” I asked. But the little prince didn’t answer. I didn’t know. At that moment I was very busy trying to repair my engine. I was quite worried because my situation began to appear to me very serious. I had so little drinking water left that I had to fear the worst. I made no reply. I was very busy repairing my engine.